Liliana Castañón Torres grew up around music and musicians, with generations of musicians in her family. At a young age, Castañón’s parent taught her the basics of music, encouraging her to experiment freely. As such, she developed a strong ear and an interest in composition early on, learning to play both the piano and drums. Later on she composed songs with more elements by utilizing various computer software. 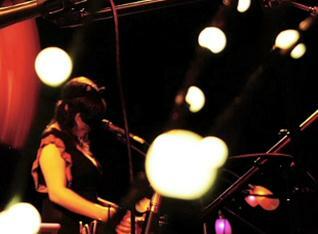 By the time she was fifteen, Castañón created "Broccoli With Botas" a project for which she was selected as one of "The Best Bands to Watch 2010" by the Universidad Iberoamericana radio station. Several months later, Castañón met Rick Maciel (LAP Fellow 2012), who invited her to be part of his “Halo Between” and “Cocky” projects. Today, Castañón plays the xylophone, percussions, and really anything that produces sounds, experimenting at times with voice and musical arrangements in “Halo Between” projects. Beyond her work with Maciel, she has also shared the stage with recognized singer Elis Paprika (Mexico).